Heal's made its name as a furniture maker through the Arts and Crafts movement of the late 19th century and the Blythe range has been designed to capture that same ethos of functional, quaker inspired furniture. Designed and developed in-house, the Blythe Large Sideboard is made from solid oak and oak veneer that has been finished in a clear matt lacquer to protect the wood while also providing a smooth finish. Inspired by Heal’s heritage, subtle design details such as the lipped top and arched silhouette demonstrate the craftsmanship at the heart of the range. Designed in-house exclusively for Heal’s. Inspired by Heal’s Arts and Crafts heritage and taking its name from London's iconic Blythe house. Seven spacious drawers and cupboards of varying sizes with traditional wooden runners and handles. Heal’s wooden cuff on the handle showing details of the craftsmanship at the heart of the range. Wooden drawers have tradtional wooden runners and features Heal's detailing on the handles. 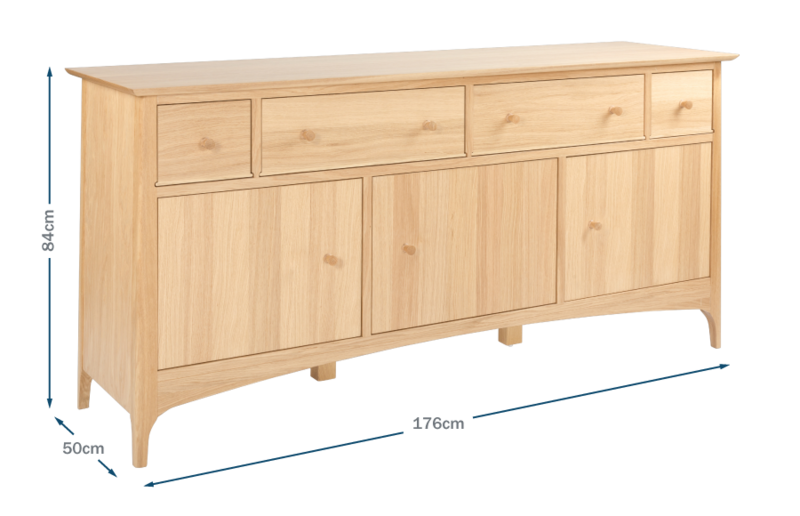 Sideboard contains seven spacious drawers and cupboard sections. Please see our Wood Care Guide. In stock, normally delivered in 2 weeks. I had an issue with the back support legs. They do not reach the ground so I thought they were too short. It turns out you are supposed to unscrew the plastic knob at the bottom for it to reach the ground, exposing the metal screw. With such wonderful styling elsewhere, this ruins the elegance of... Read More. I had an issue with the back support legs. They do not reach the ground so I thought they were too short. It turns out you are supposed to unscrew the plastic knob at the bottom for it to reach the ground, exposing the metal screw. With such wonderful styling elsewhere, this ruins the elegance of the piece.